This wretched hive of scum and villainy is obviously Mos Eisley on Tatooine. Judging from the lone stars on those minarets and generally dry looking environments, this is obviously Texas. I’ll pinpoint it to Laredo, Texas, though I’m comfortable to leave it at that. Burgas, Bulgaria. 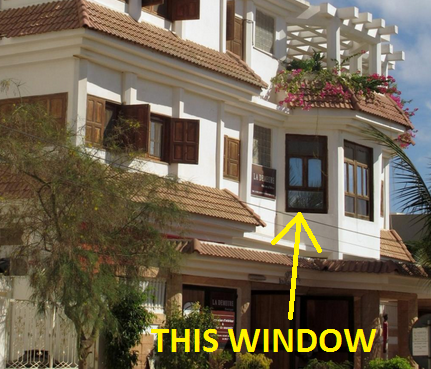 Thinking this due to red roofing tiles, and would have to be in the southern coastal region of the county for palm trees. My wife, who is Han Chinese, is from Kashgar, Xinjiang. I’ve never visited there but it looks like a Uighur guy walking in the foreground. There appear to be Chinese license plates on the car. The mosque has what appear to be Chinese stars on it. And the buildings look like those in Kashgar. Anyway, a WAG for what it’s worth. I always follow but seldom play. I thought it had to be a mosque in Africa (like there are few of those). License plate white on black: the Gambia? No standing sign, so former English colony: the Gambia? I have spent maybe two hours trying to track down mosques in the Gambia, with a detour to Sierra Leone on Open Street Map and Google Maps aerial view, but no dice finding this nice domed mosque with two brick minarets. Oh well. This is why I don’t play!! then I gave up too soon. Of the star and the moon! ….. some place in Tunisia? A window. In dire need of washing. Four late model cars produced by Suzuki and Toyota. A license Plate, white on black. A man dressed as if in an Arab country or as an Afghani Pashtun. A domed mosque under construction with the star and crescent motif on its minarets that mimics the flag of Mauritania. A wall split air conditioner that, based on the red logo was probably made by Chinese company Ningbo AKL Electric. A round top orange door. A European style “No Parking” sign. Trash bins for regular pick up. Ok, so the license plate says we are in Tunisia, but where in Tunisia? After seven hours of searching, I have no freaking idea. Only Chini and the person who took the picture know. 2. A certain group of VFYW contestants who insist that everything they can’t figure out comes from “Tatooine” and you being JUST snarky enough to hoist them on their own petard because there IS a Tataouine, Tunisia. 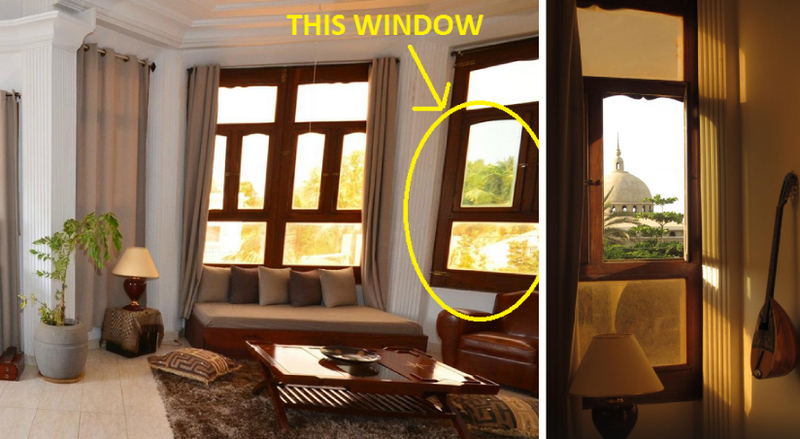 So I’m stating that the picture was taken from the Hotel el Ghazel, Tataouine. I hate you all. Way to wrap up the year, you clever bastards. The crescent/star on the minarets are distinctive in the way the moon faces up. This is pretty distinct and is used the flag of Mauritania. After plugging away online looking for mosques in that country I looked at the original again and saw that the second tower isn’t “different,” it’s unfinished. It won’t show up because, until recently, it hasn’t been there. The building behind the minarets is a mere skeleton. Clever bastards! I hope someone has more luck than I did looking up hotels and guest houses to find that street. Mosque in the background. Man in Islamic garb, appears clearly African. Dry but tropical. Coastal vibe. Signage suggests British colonial history. Cars and garbage cans suggest relative wealth. Appearance of license plates resembles Senegal. Can’t find the specific towers shown, but I’m going with Saint Louis, Senegal. Since the building in the picture is clearly a mosque, and there is an African-looking man in a prayer cap walking in the street, I’m going to go with Dakar, Senegal. The buildings look like Dakar to me (I was there back in 1990) and Senegal has blue license plates. Looking closely, it seems like the front two letters of the plate are DK for Dakar. So that’s my guess. I can’t identify the neighborhood, I just know it doesn’t look like the Grand Mosque so presumably it’s a smaller local one. 1. Blue license plate plate on the white SUV. Couldn’t focus in too much but I think I can make out the ‘DK’ for Dakar. 2. Reddish color of the sand. 3. Mosque in the background. Senegal is approximately 92% Muslim. 4. Dakar is often in a state of construction. Lots of unfinished home improvements and construction projects. This could possibly in the Almadies neighborhood near my parents’ home. Well, normally I don’t even try these contests, as I know I won’t be able to get very close. The only one I was able to recognize before this was the Alhambra, Granada, and I wasn’t able to discern the precise window. 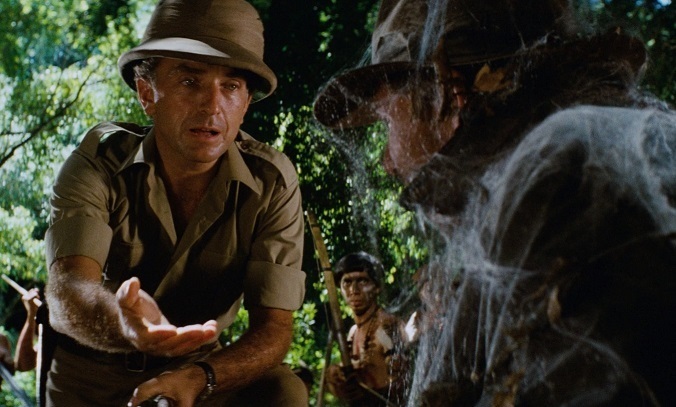 However, your announcement that this week’s contest was very difficult piqued my interest. I teach Islamic Art, so was able to quickly identify the mosque as North African. After looking up license plates online, I was able to identify the country as Senegal. The soil color and vegetation support this conclusion. I spent much too much time today looking at fuzzy mosques in Senegal on Google Maps, but wasn’t able to firmly identify any as this mosque. There are an awful lot of mosques to look at! Dakar is a reasonable guess just due to its sheer size, and I wasn’t able to find anything at all similar in other towns. The closest mosque to the one in the picture (grey dome, two square minarets) is Grande Mosque Hann Maristes I, but I don’t think it is the same – that mosque is a bit larger and in a more built-up area. The street it is on does not have a name in Google Maps. Nevertheless, I can tell the view is from the south because of the mosque’s orientation. 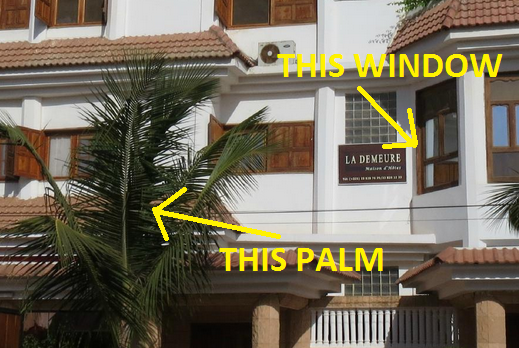 This week’s view comes from the La Demeure B&B in Dakar, Senegal. Rather than an address, the hotel website provides GPS coordinates: Latitude 14°44’07.74″ (North), Longitude -17°30’26.66″ (West). We are looking northeast out from the hotel’s Zanzibar room towards a mosque that is under construction. 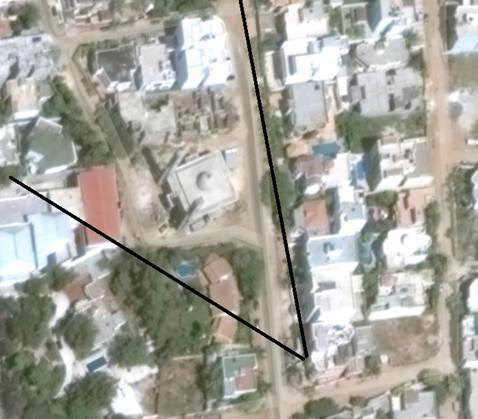 La Demeuere is located in the Ngor neighborhood of the Almadies Arrondissement on Cap-Vert (NASA Earth Observatory image of the day here), the western most point in Africa. The picture looked like it was taken in Africa, particularly a coastal area in or near the Sahel. And the license plate seemed like it came from Senegal. Once in Senegal, it took a bit of time to find the mosque and hotel; mostly because the mosque is too new to appear on maps yet. “Oh no!” I cried, when I realized what was in this week’s picture. Another still-in-construction mosque, as in contest #235. In other words, a mosque whose pictures are very hard to find, like that mosque in Antalya. This time, however, there weren’t other clues; yes, I could tell that the photo was shot somewhere in the Sahel region, in Africa (Islam, palms, sand, the gentleman’s outfit), but the decisive clue to guess the view was doubtless the mosque. And the prospect of spending the next few hours sifting through hundreds of photos of mosques, probably in vain, was very unpleasant, to say the least. What could I do? “What would Chini do?” I asked myself. This is a mosque which is being built in Dakar, Senegal. See the upper part? It’s exactly the same as our mosque’s. So let’s turn to Google Maps, looking for mosques in Dakar. Sixty mosques later, we come to the conclusion that our mosque is not labelled as such in the map – which was to be expected, if it really is still in construction – or that it is somewhere else. A quick search in the other major cities of Senegal gives no results, so we are soon back to Dakar. What comes next? Almost all of the contest pictures are taken from a hotel’s window. This time we are lucky: not only are there fewer hotels than mosques in Dakar, but the third hotel in the list is the one we were looking for. 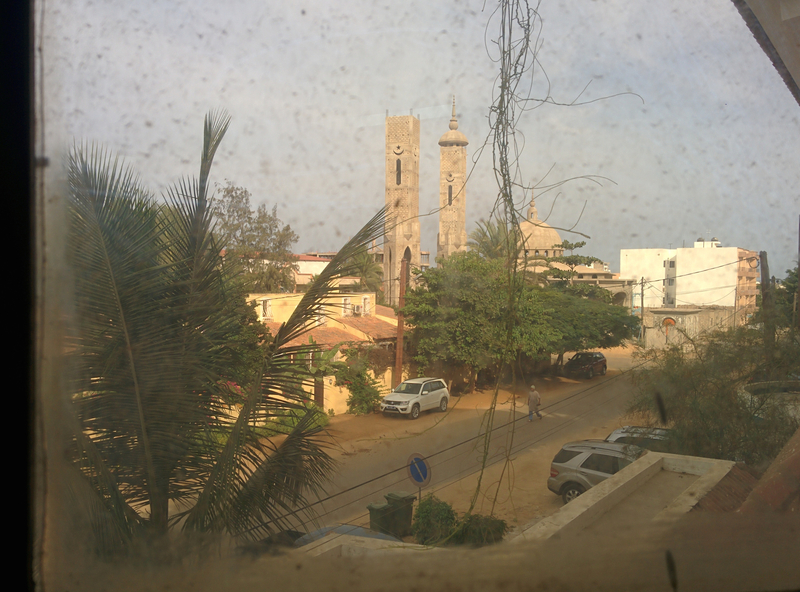 This week’s picture was taken from the Zanzibar suite, on the second floor of La Demeure hotel, in the Almadies neighbourhood, Dakar, Senegal. At first glance, this one felt like North or West Africa. Looking more closely at the mosque architecture, it reminded me of some West African mosques I’d come across working on previous contests. (I think I may have learned more about regional Islamic architecture than anything else in the time I’ve been doing the contest.) Looking at the clothing on the man in the frame also made me think West Africa. 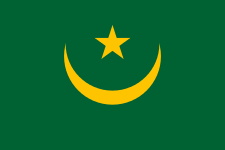 The positioning of the crescent and star on the minarets is like that on Mauritania’s national flag, but the other aspects looked closest to images I’d found from neighboring Senegal. (Also the front license plate that is visible looks like it could be Senegalese but it’s too blurry to tell for sure.) I came across an in-progress mosque in Dakar that really similar. I Googled “new mosques under construction in Dakar Senegal” and found views like ours on TripAdvisor. I found the location of this week’s photo in the traditional VFYWC manner – hours of fruitless searching combined with a few moments of luck. The photo appeared to be taken in a part of Africa with an Islamic population. The European-style street sign in this week’s photo resulted in a brief spell researching the African signatories to the Vienna Convention on Road Signs and Signals (surely the UN has more pressing matters to address?!) and cross-referencing pictures of licence plates from those countries. Once I convinced myself that the first two letters on the licence plate of the car in the photo were “DK”, I then focused on Dakar in Senegal as the most likely candidate. After a searching through photos of mosques in Dakar for way too long, I changed course and stumbled across the above photo which shows the dome of the mosque. This lead me to Le Demeure, where it was easy to identify the correct room as the Zanzibar. Thanks for an enjoyable way to pass some time at work during the first couple of days back at work after the Christmas/NYE break. I’ve been visiting Dakar periodically for work and to visit friends since 1989. In earlier years I used to stay in or near downtown Dakar, including a couple of times at the funky Lagon II, which gives the impression of being on a cruise ship. However, as work and friends have moved out towards Fann, Mamelles, and Almadies, I now usually stay at La Demeure Guesthouse. Don’t let the dirty window fool you. 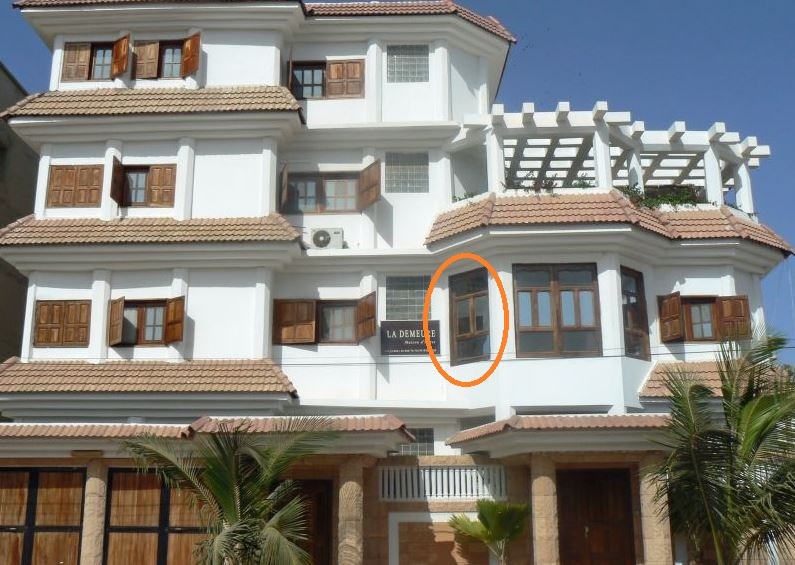 It is very charming and well maintained where you can easily feel at home during long stays. They seem to be replacing windows one by one, although I haven’t figured out their criteria for choosing windows to replace. The view is facing northwest and is taken from the Zanzibar room. Just before leaving Dakar I went to a Christmas party with friends at the house on the corner where the red vehicle is. As for the unfinished mosque, I don’t know the full, or possibly even accurate story, but apparently it was begun as a private project from the previous mayor of Dakar, but came to a halt at some point after he lost the last mayoral election. Knowing that there are other Dish readers in or passing through Dakar and that this place isn’t really off the beaten track, I expect you will have several correct guesses. Hopefully someone else can fill in the details about the mosque.